Situated 5 km east of Martinborough village, Escarpment’s 24 hectares of distinctive alluvial gravel, terraced land stretches out along the banks of the Huangarua River. Escarpment Vineyard was established in 1998 as a joint business venture between Robert & Mem Kirby (of Australia’s Village Roadshow) and Larry & Sue McKenna. The impetus behind establishing this vineyard came from the four’s deep love for Pinot Noir. Meeting by chance in 1998 through Dr Richard Smith, Larry and Robert quickly hit it off and realised they had more than a love for the grape in common. Serious talk about establishing a definitive New World vineyard began in earnest even then and the ‘idea whose time has come’ has resulted in one of the most significant vineyard developments in the New Zealand district of Martinborough. 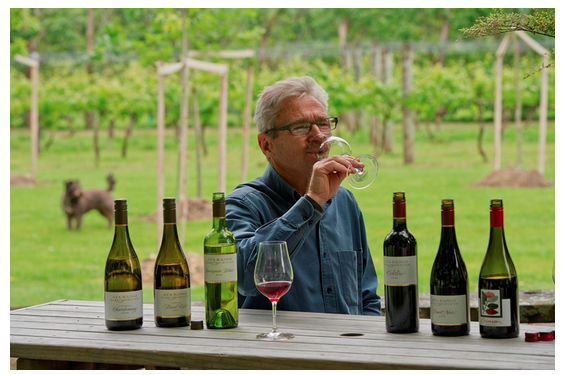 Larry has firmly established himself as a leading Pinot Noir winemaker in New Zealand and has been called everything from the ‘Prince of Pinot Noir’, the ‘Godfather of Pinot Noir’, a Pinot Noir ‘legend’, and ‘maestro’. He takes a collaborative approach to wine making and believes in sharing his knowledge and understanding with fellow winemakers to ensure collective learning and progression occurs. They soon discovered the Te Muna river terraces across the other side of the hill and knew this was it for them! Being an extension of Martinborough’s famed “terrace” land, the Te Muna site offered all the right “attributes”, with land a-plenty for their purposes. Larry and Sue firmly believe the Te Muna valley is the new future of Martinborough. Evidence for this is seen in the range of new vineyards being established in the area, including much talked about Craggy Range. The Edge is a 100% Martinborough Pinot Noir, grown on the alluvial gravel terraces for which the district has become famous. The season was unusually cool and wetter than normal resulting in elegant restrained wines with lower alcohols. Hand harvested, hand plunged in open topped fermenters and handled using gravity where possible – minimum pumping used. When this is on offer at Waitrose, this is an excellent introduction to the wines of Escarpment and Larry McKenna, one of the pioneers of Martinborough wine, as well as to New Zealand Pinot Noir. The entry level product in the Escarpment range, this was a very enjoyable, smooth, Pinot. Not a powerful nose but plenty of fruit on the palate dominated by Cherry, Strawberry and blueberry with savoury and earthy, green notes. The latter greenness making this not quite as structured as other NZ Pinot's. Now I'd like to try some of his other Pinot's in their range - Kupe, Paha and Kiwa. Ata Rangi, meaning "dawn sky" or "new beginning" is a small New Zealand winery with a big reputation for serious Pinot Noir. Located near Martinborough at the southern end of the North Island, it is owned and managed by a family trio - Clive Paton, his wife Phyll and his sister Alison. According to wife Phyll - Clive planted his first vines at the edge of the Martinborough village in 1980 as one of a handful of people who pioneered winegrowing in the area. Ata Rangi was a small, stony sheep paddock when Clive bought it with a wad of cash from the sale of his herd of cows back in 1980. His farming mates thought he was mad; grapes were unheard of in the region. But Clive knew the area well. "I'd regularly skin my knees playing rugby there, so I knew exactly how stony the ground was." He'd developed a passion for red wine but couldn't afford 'the good stuff' so, in classic Kiwi-style, thought he'd have a go himself. Ali, Clive's sister, shared his vision and soon bought 5 acres next door before heading off shore to study and work in the London wine trade. Martinborough was pretty basic in those days - gravel roads, two pubs, a grocery/farm-supply store, service station and a fish-n-chip shop. Clive's resolve was strengthened by a 1978 scientific report which showed Martinborough had a microclimate similar to that of Burgundy. It also had the driest and windiest climate in the North Island, was fringed to the north-east by a 25 metre deep, free-draining alluvial gravel terrace, and was only an hour from the lively capital city of Wellington. The early days were tough. With no trees for shelter, young vines struggled against the howling nor-westers. Clive relied on the sale of pumpkins and garlic that he'd grown between the rows. He was also a solo Dad, raising young daughter Ness. Local farmer and mate of Clive's, John Stephen, put up cash to form an early partnership, keeping Ata Rangi afloat until the vines came into production. They also enlisted 100 'barrel share' investors, each of whom stumped up $50 (in a primitive en-primeur scheme) to fund the first barrels. In 1982, soon after purchasing the Ata Rangi home block, Clive called Auckland winemaker Malcolm Abel and volunteered to work a vintage. He knew that Malcolm was also chasing premium pinot noir, and the two soon became close friends. Malcolm died unexpectedly a year later and the Abel Vineyard itself was ultimately lost to urban sprawl. But Malcolm had already given Clive some promising pinot cuttings, the offspring of a single vine cutting allegedly taken by a traveller from Burgundy’s finest estate, Domaine de la Romanée-Conti . The illegal cutting had been intercepted and confiscated at Auckland airport, where Malcolm, coincidentally, was working as a customs officer in the mid 70’s. He immediately understood its significance, and sent it straight to the state-owned viticulture research station of the day. Malcolm waited patiently for the first cuttings to become available, and duly planted them. To this day, the Abel Clone, or Gumboot Clone (legend has it the stolen cutting was hidden inside a Kiwi gumboot) remains at the heart of Ata Rangi Pinot Noir. Ata Rangi Pinot Noir is the winery's flagship wine, and in 2010 he was honoured with the title "Grand Cru of New Zealand". Grapes from vines that range in age from 10 - 30 years are meticulously hand-sorted as they arrive at the winery, with individual blocks and clones fermented separately. About ten months later a blind tasting, barrel by barrel, decides the first ‘cut’. The original 30-year old home block ‘Gumboot Clone’ and best plots of Dijon Clone are used. A warmer than average season delivered excellent ripeness not only to the berries but also to grape stems and seeds, allowing the team to include around 10% whole and intact bunches in the ferments. This technique chosen only in warm seasons allows a portion of ripe stem tannin to supplement the skin and seed tannins in bolstering a wine’s shape and structure. Crimson red in the glass, with deep aromas of vanilla, cherries. Flesh, tannins are fully expressed yet in a refined way but give the wine plenty of opportunity for ageing. The finish is long and complex. A great story around Ata Rangi and a lovely wine.